White Settlement ISD, in partnership with the Tarrant Area Food Bank, offers an In-School Food Pantry. The Paw Pantry provides eligible WSISD families with free produce, meat and non-perishable food items on a designated day every month. Eligible families should submit the Food Pantry Application to their child's school. 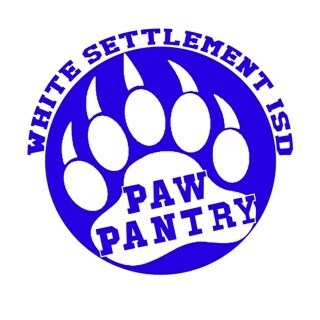 The WSISD Paw Pantry is located inside Brewer High School, 1025 W. Loop 820 North (enter on the east side of the building near the pond). For questions, contact your child's school counselor or Hannah Hughes, WSISD social worker, at 817.367.1200, ext. 4209. Enter on the east side of the campus. 9:00-10:30 a.m. & 4:30-6:00 p.m.